Amaretti, even the name sounds delicious. 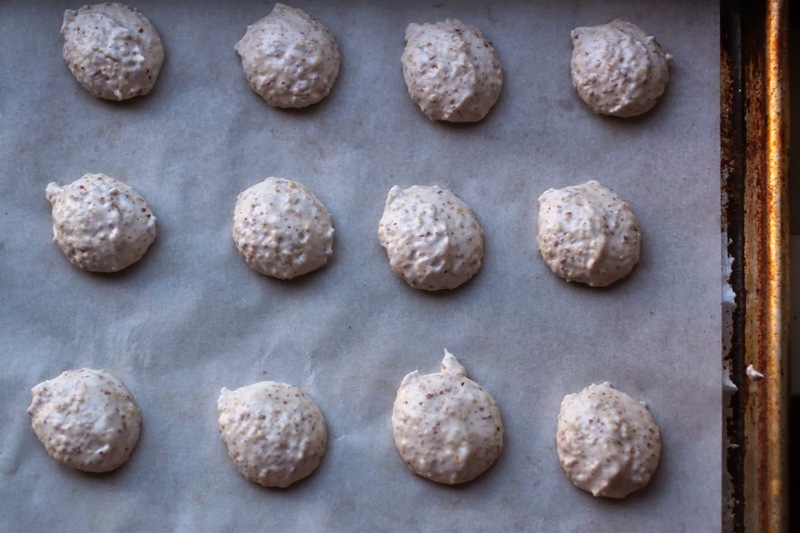 These little cookies are so simple to make, it is almost a crime not to whip up a batch. Of course, you have to be a fan of the bitter almond flavor the almond paste contributes to the cookie. Way back when, in my days of working at the World Trade Center in New York City, I was a pastry cook in the hotel that sat between the two towers. Our pastry chef, who was from France, had us make these all the time but he called them macaroons or maybe macarons, it was a long time ago and I cannot remember. The recipe was nearly identical to the one we used at the hotel. This I do remember because I still have the recipe and I make them from time to time. The crazy thing about all of this, I was probably toiling away, below the plaza while Nick Malgieri, the contributor of this recipe to Baking with Julia, was working away at the top of the towers in the world famous restaurant, Windows on the World. Small world, isn’t it? 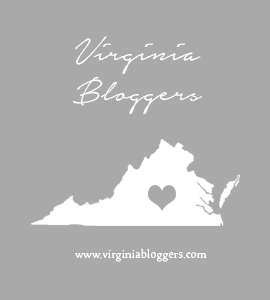 To see what the other Tuesdays with Dorie-Baking with Julia bakers came up with, be sure to check the homepage. Consider baking along with us if you have the book, or buy/borrow one and join in on the fun. We are also baking our way through Dorie’s new book, Baking Chez Moi. a day late and a dollar short-almost. thought this challenge was next week and nearly missed it. 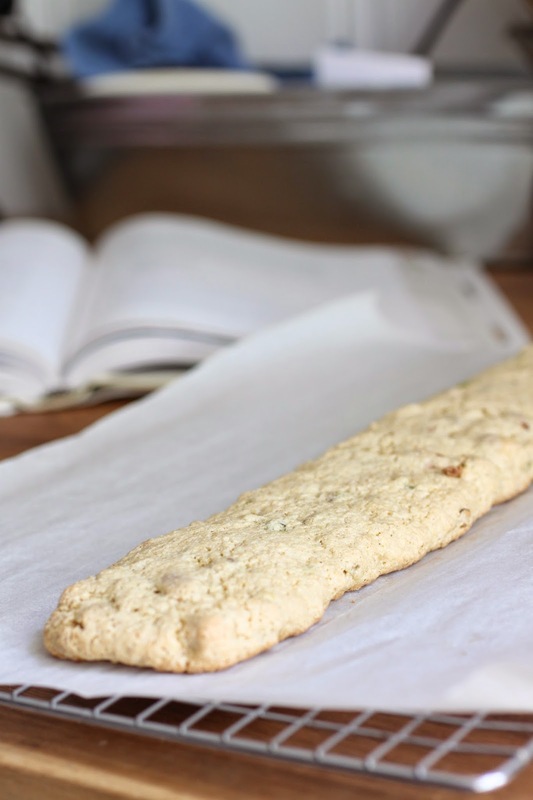 luckily, cantuccini are easy to make with this recipe from nick malgieri and the recipe from baking with julia is the same as this recipe on his website. since i really did not want approximately 80 cookies in the house, i made one third of the recipe. still, i ended up with about two dozen small, crispy cookies. honestly, i am a bit of a biscotti snob. 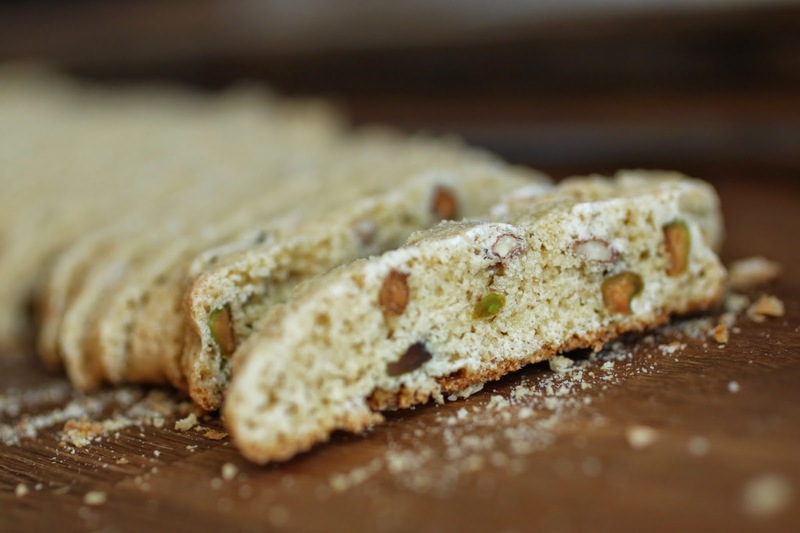 when i first opened my wholesale only bakery in 1997, all i made were biscotti. my husband and i sold them to nearly every coffee house in town. my preference is for a softer texture and by softer i do not mean chewy or moist. 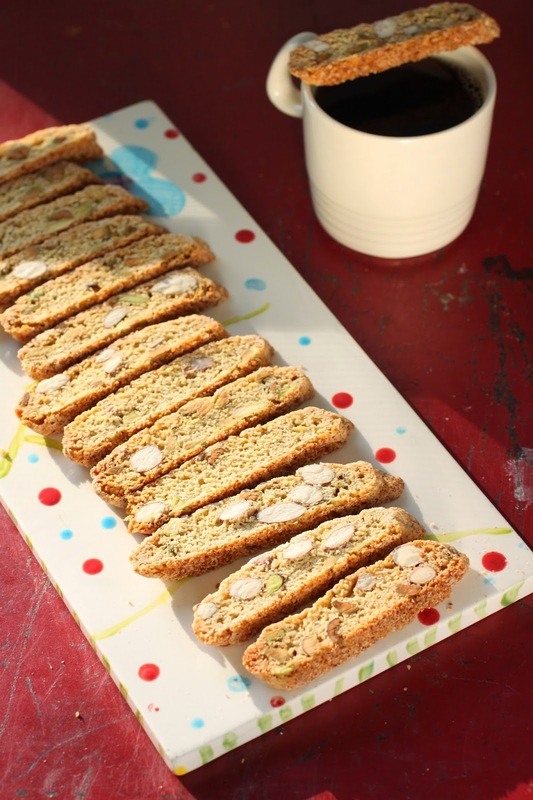 my biscotti are dry like a biscotti should be; the difference is that they do not need a soaking to bite into. luckily, neither did these cantuccini when sliced according to nick’s directions-1/4″ thick. today also happens to be my husbands birthday. he loves biscotti and i knew he would enjoy these. to bake a cake for just the two of us is really a waste and with a cookie like these, i knew they weren’t going to get stale before they were gone. the recipe calls for whole almonds and since i was making just a third of the recipe, i only needed 1/2 cup. and of course, i didn’t have that many. they quickly became almonds and pistachios. just to make it interesting, i subbed semolina flour for half of the all purpose flour and added a little kewda water. if you have never heard of kewda water, it is a floral flavoring similar to rose water and is quite common in indian cooking. to find it, visit and indian or pakistani market, they are sure to have some. nick takes one step in slicing the biscotti that very few recipes follow and it is also something i learned on my own many years ago just by trial and error. to get perfect slices with almost no breakage, you must let the baked cookie log cool completely. wrap it up and slice it tomorrow if you have to. 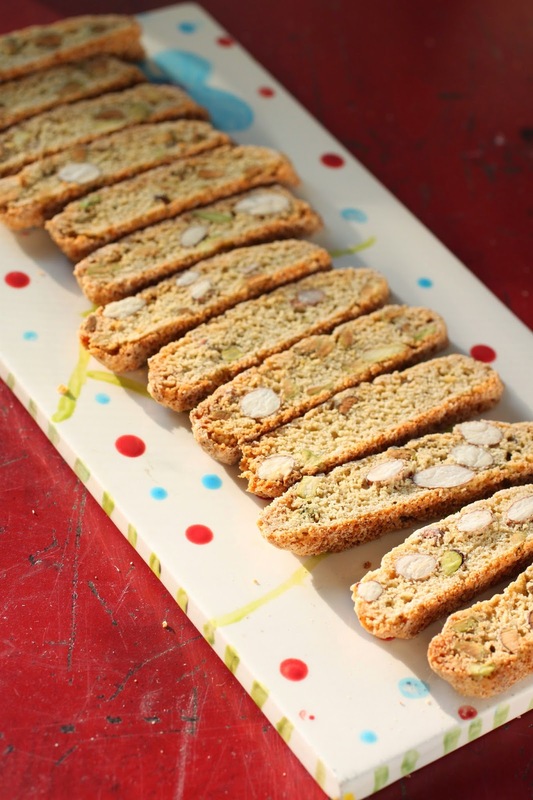 the reason is that the internal moisture will distribute as the biscotti cools and when completely cold, the crispy outer crust will soften and prevent the edges from breaking as you slice through the log. so listen to nick and listen to me-let it sit!!! beautiful, clean slices. 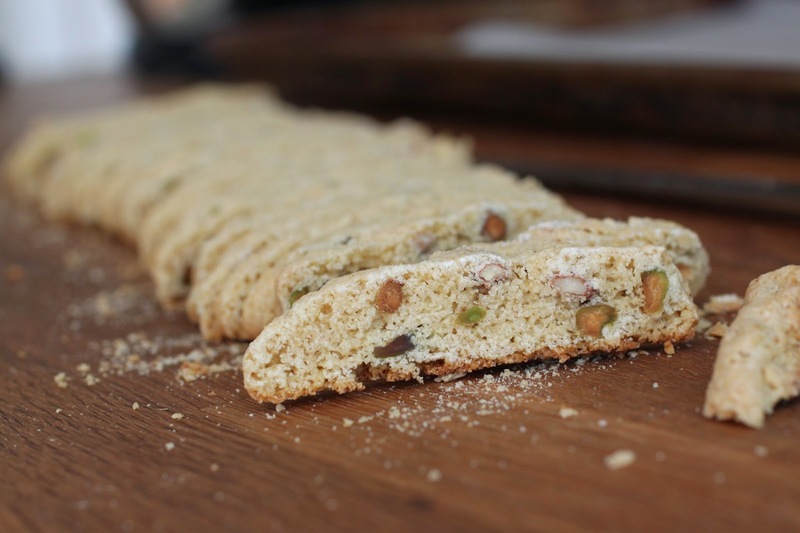 love the color that the semolina and the pistachio give the cookies slices. and this is how the log looked after i sliced it-see, no broken pieces! 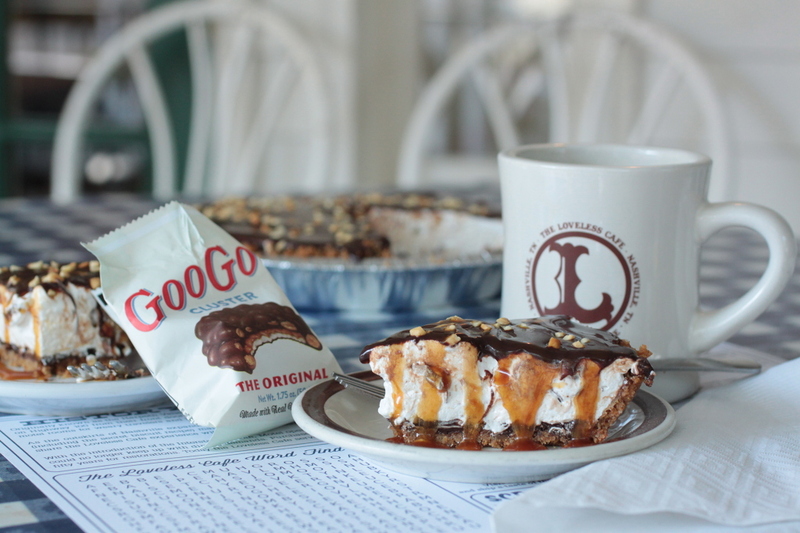 the perfect accompaniment to a cup of coffee in the late afternoon. too bad the husband wasn’t here to share them-he went morel hunting instead. what can i say, it is his birthday-and i have a feeling i know what we are having for dinner tomorrow…happy birthday darry! 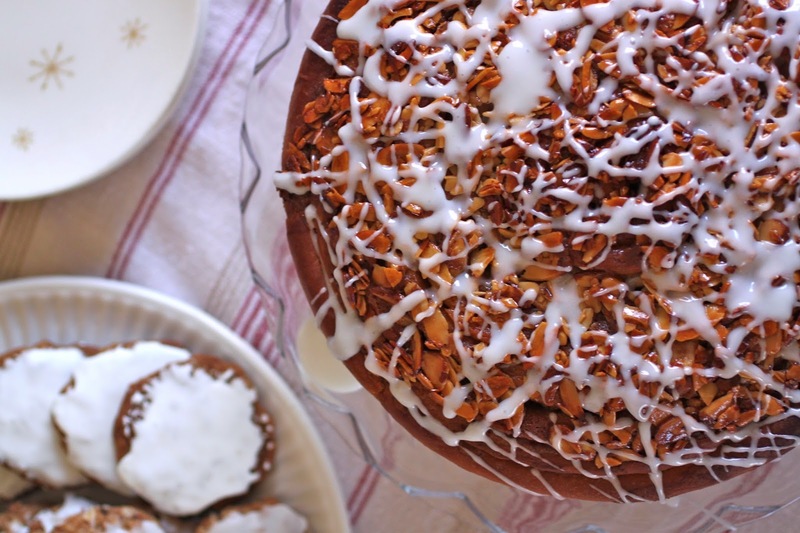 to see what the other bakers came up with, visit the tuesdays with dorie page! cakes are wonderful. so many flavors to try. almost as many shapes to bake them in. honestly, there is something really special about a tube pan. whether it is baked in the standard angel food pan or a fancy bundt pan, does not matter, either type will work and all of them add a little extra magic to the cake. bundts and tubes make great cakes for parties, picnics and potlucks. they generally do not need much frosting and slice well. for me, the cakes are the perfect gift to take out to the garden to thank my fellow garden volunteers for helping tend to the beds. they are also a great choice to take to the class each week to share with the interns since slices can be nibbled without the need for a plate or fork. the biggest challenge i face is choosing a flavor each week, sometimes twice in a week. this week, i chose to pair almond paste and tart cherries. my favorite coffee cake recipe is so versatile that adding almond paste is a great way to make the same cake seem different. 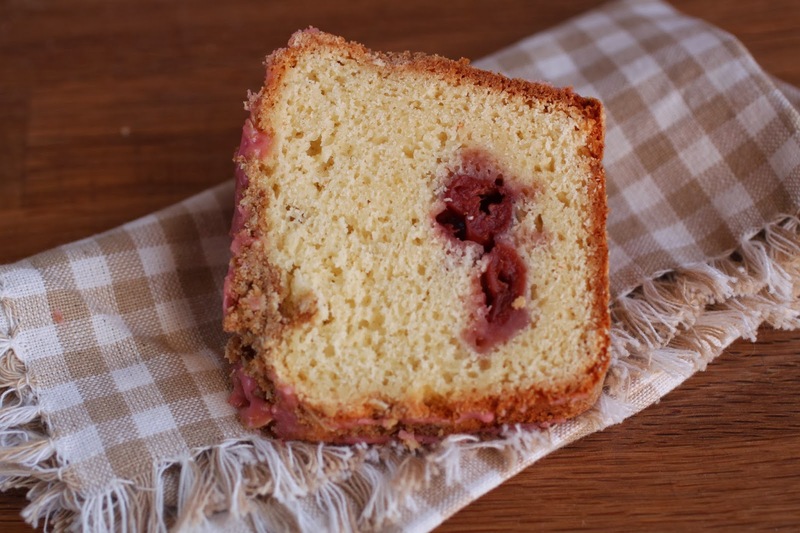 this cake recipe uses the same base recipe as the cranberry-orange coffee cake i posted several weeks ago. almond paste is easy to find, it is sold in the baking section of the supermarket, usually near the pie and pastry fillings. the little cans have 8 ounces of almond paste in them and while it seems like a small amount, a little goes a long way in terms of flavor. when i open a can, i always cut it into four equal pieces and since i generally use just two ounces at a time for a coffee cake, i wrap each piece and store them in a container in the freezer. then when i need some, i simply pull it from the freezer, cut it into cubes and let it thaw out and soften before adding to the batter. to use in the recipe, i generally replace about 1/4-1/3 of the butter with almond paste. another thing i love about tubes and bundts, you can hide a filling in them without having to worry about the cake collapsing from the weight! for this recipe, i used some really well drained tart red cherries. ssshhh…the filling is a secret! and if the cake wasn’t already enough, i went and added crumb topping. actually, it could be that the cake was the vehicle for the crumb topping, just sayin…i love crumb topping! however, i just couldn’t help myself. it seemed like such a waste to pour the cherry juice down the drain. quickly, i stirred the cherry juice into some powdered sugar. 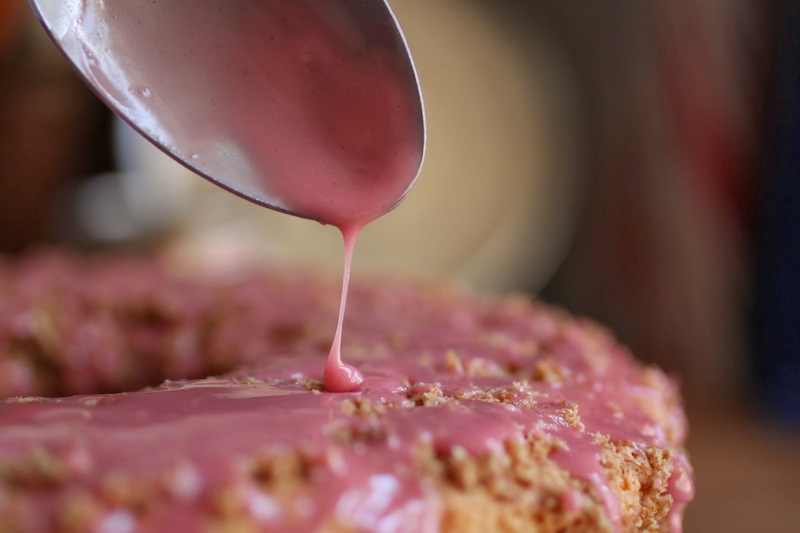 pink glaze for the top of the cake, add enough juice to make a slightly thin glaze that drips slowly from the spoon rather than running off quickly-a thicker glaze will stay on the cake better than a runny one. now that’s a coffee cake! careful little drizzles prevented it from getting soggy and saturated with glaze. 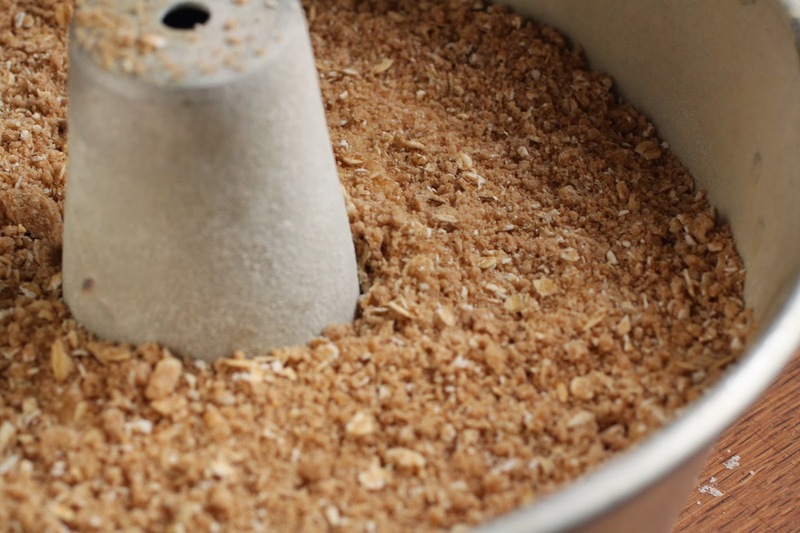 to make the crumb topping, place the flour, oats, brown sugar, cinnamon and baking soda into the bowl of a food processor. pulse a few times to combine. sprinkle the butter cubes over the top of the mixture and pulse to cut it together. continue to process the mixture until it begins to clump. dump the mixture out of the bowl and set it aside. preheat the oven to 350. grease and flour the tube pan and set it aside. to make the batter, place the butter, almond paste, sugar, and salt into the processor bowl and process until smooth. with the motor running, add the eggs, one at a time and process until mixed. scrape the bowl and pulse a few times to be sure it is combined. dump the batter into a large mixing bowl; the rest of the recipe is combined by hand with a rubber spatula or a large wooden spoon. place the flour and baking powder into a sifter or a mesh strainer and sift it over the batter. fold the mixture a few times, sprinkle the buttermilk over the batter and fold it together. carefully place half of the batter into the prepared pan and spread it out so there are not huge gaps and vacant areas-it does not need to be perfectly level. 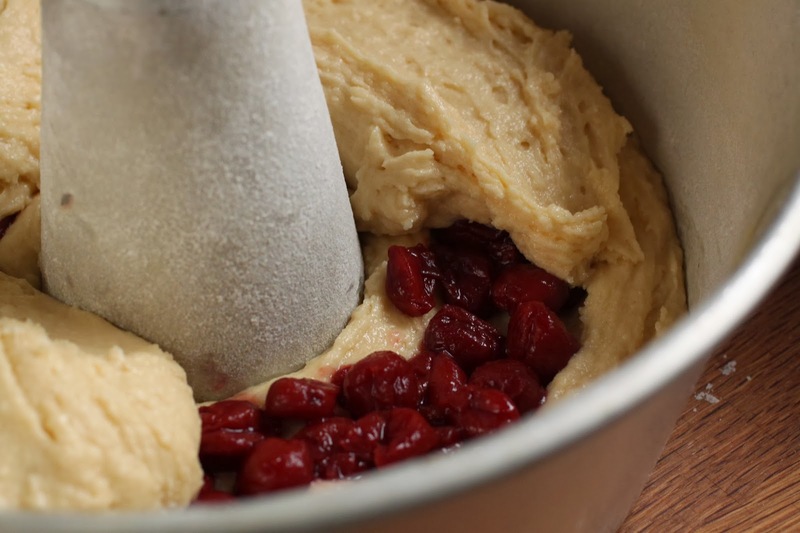 arrange the drained cherries over the batter in the pan and top them with the remaining batter. sprinkle the crumb topping evenly over the cake and bake until a pick inserted comes out clean, about 1 hour. cool the cake in the pan for 20 minutes and then remove it from the pan and allow it to cool completely on a rack. to make the glaze, sift the powdered sugar into a bowl. 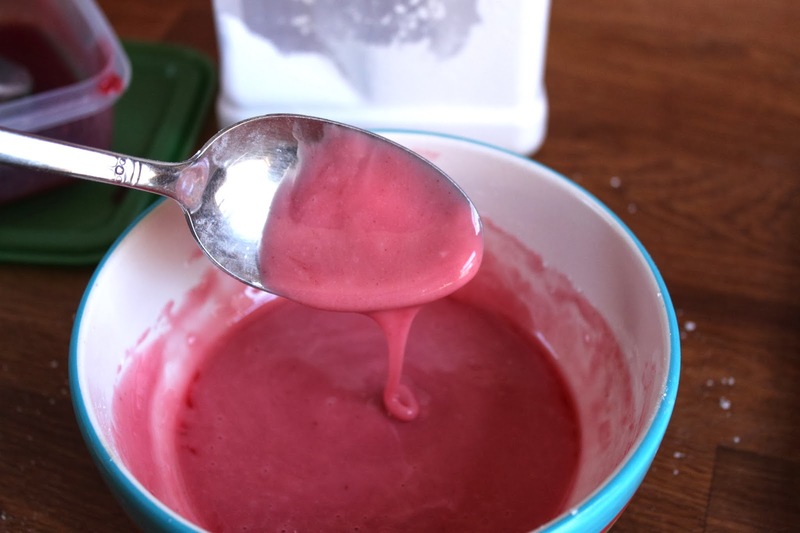 while stirring, add enough of the reserved cherry juice to make a slightly thin glaze that pours off a spoon slowly. drizzle small amounts of the glaze over the cake on the rack-how much you use is up to you, i used the entire amount for this cake. the cake is best cut when completely cool. to store, keep it covered in a cake container at room temperature up to 2 days. to store in the freezer for up to a month, cut and wrap slices well in plastic and place them in a plastic container or bag before freezing. thaw the slices, still wrapped in plastic, at room temperature. breakfast breads are some of my favorite things. sweet, tender, yeasty, full of cinnamon and when warm from the oven, nearly impossible to resist. swirled breads and rolls always catch my attention and if i am making a batch at home, you can be sure it will be some sort of cinnamon swirled, yeast raised bread. lately, i have seen any number of monster sized rolls baked in a cake pan and decided to take that route. a standard sized recipe that would normally make about a dozen rolls was rolled out into a thin rectangle that measured 24″x 10″. to make the filling, i broke out my secret recipe which is the topping for another of my favorite breakfast breads, a concha. if you are unfamiliar with conchas, visit a hispanic bakery; they are large, fluffy sweet rolls with a crunchy cinnamon topping that has a shell pattern to it. a buttery cinnamon mixture is spread on the dough and then the dough is cut into 2″x 24″ strips. 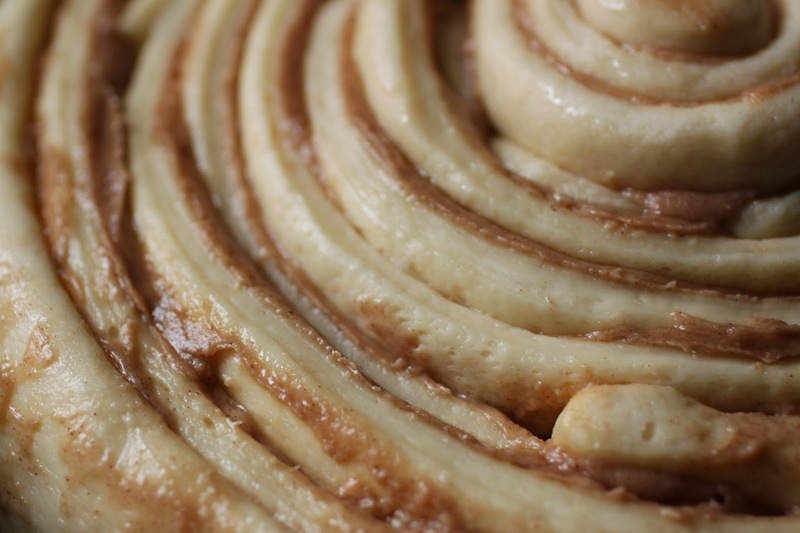 the strips are continuously wound around each other to make a giant spiral of dough and filling. 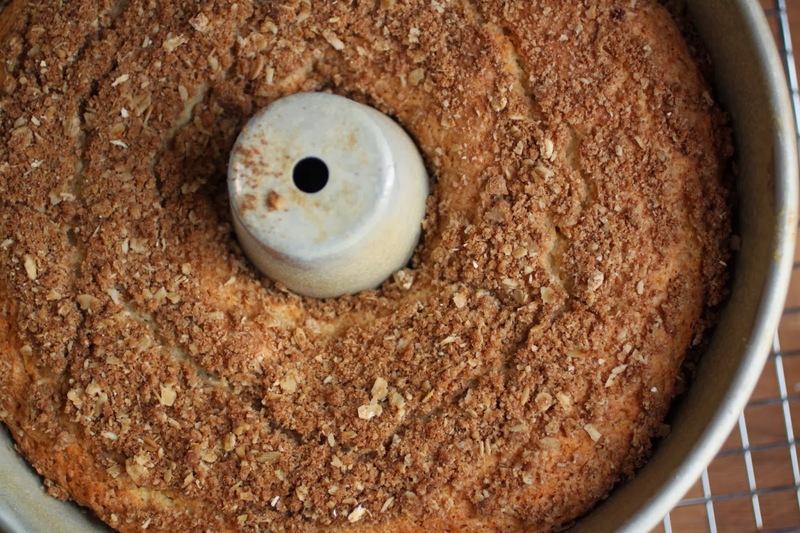 it is placed in a 10″ cake pan and allowed to rise so that it fills the pan. but as always, i didn’t stop there. to top off the cake, i cooked up a batch of my favorite almond topping. 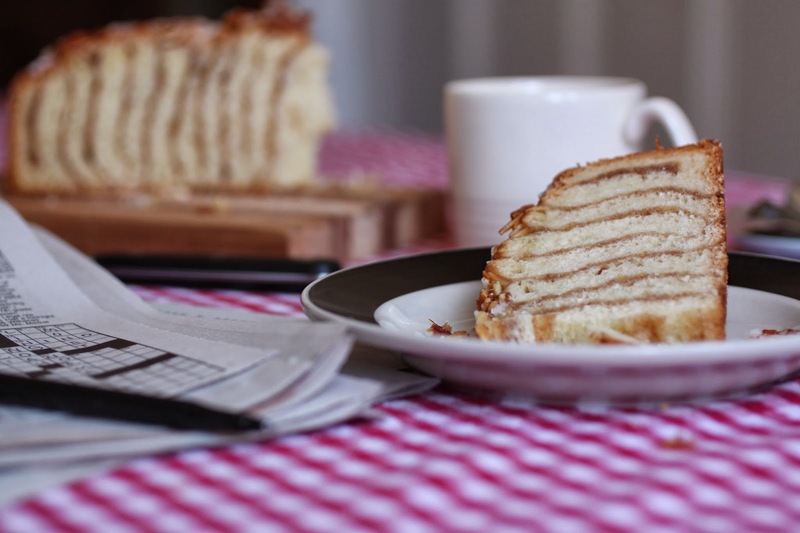 there is a traditional german cake called a bienenstich, bee sting in english, which is made of layers of cake with custard filling and a crunchy almond topping. 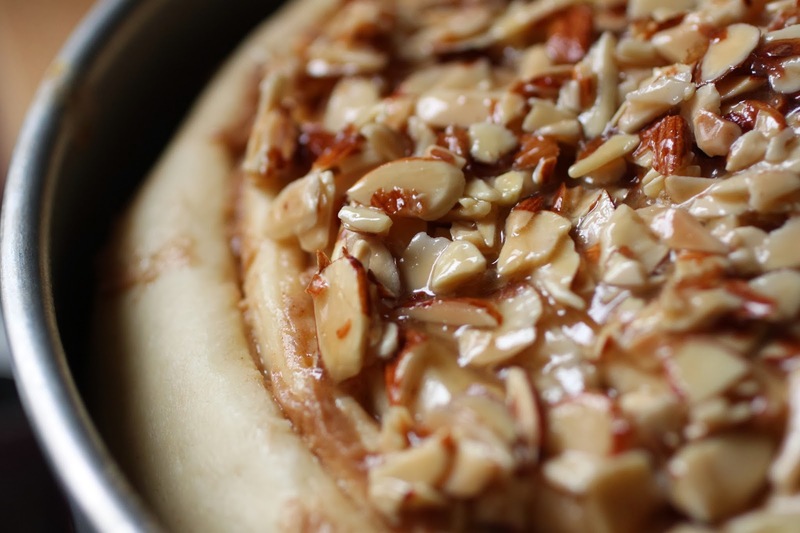 the topping is made with butter, almonds, cream, flour, honey and brown sugar and it is cooked until it boils. the hot topping is spread over the completely risen cake just before baking and then the cake goes into the oven so the magic can happen. after about an hour, the cake is ready; cool it in the pan for at least 10 minutes then carefully remove it. one note, i never use springform pans. the thin gauge metal allows the outside of the cake to burn before the inside is cooked and they always leak! just use a regular 10″ cake pan and when it is cool enough to handle, place a plate on the top and invert the cake. pull off the cake pan, place another plate on the bottom of the cake and invert it again. then prepare the drizzle and drizzle away! this cake is best served while still warm from the oven but it reheats nicely. gently heat the milk to about 100 degrees F. add the yeast and stir it to combine. allow the mixture to sit until the yeast starts to get foamy. add the sugar, salt, butter, egg and about 3 cups of the flour and mix to make a soft dough. using the dough hook with the machine on medium low, continue to add enough flour that comes together and forms a smooth that cleans the sides of the bowl. continue to knead the dough for about 5 minutes then place it in an oil bowl to rise until doubled, about 1 1/2 hours. while the dough rises, make the cinnamon filling and set it aside at room temperature until needed. when the dough is ready, remove it from the bowl and place it on a large flat surface. 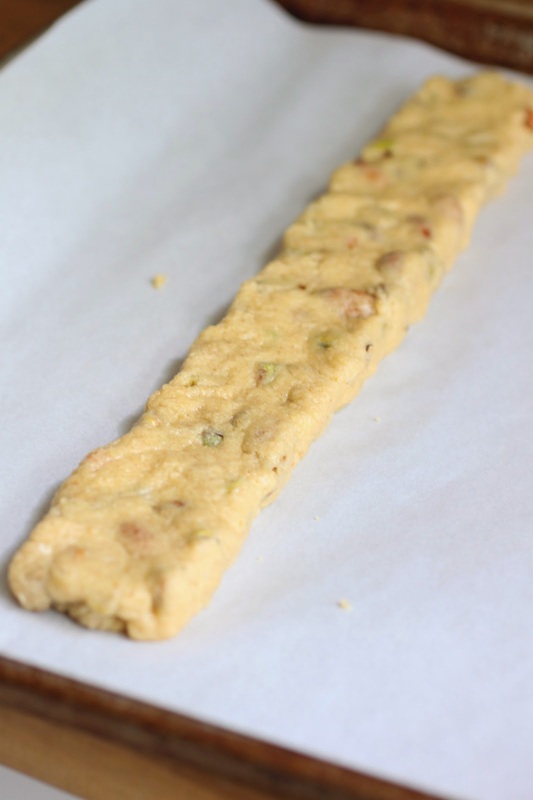 using a rolling pin and a small amount of flour, roll the dough out to a long rectangle measuring 10″ x 24″. spread the filling evenly over the surface. using a pizza wheel/pastry wheel, cut the dough into long strips measuring 2″ x 24″ each. starting with one strip, roll the dough up into a spiral and place it in the center of a 10″ heavy gauge aluminum cake pan (not a spring form pan) that has been greased and lined with parchment paper -grease the paper too. 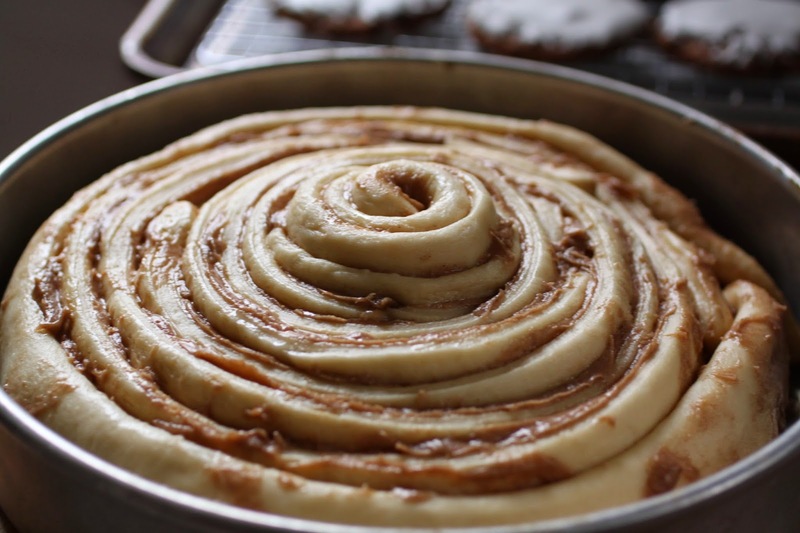 take the remaining strips of dough and continue to wind them around the spiral to make a giant cinnamon roll. cover the cake with plastic and allow it to rise until it fills the pan, 1-2 hours or place it in the fridge overnight, take it out and allow it to sit at room temperature for about an hour before baking. 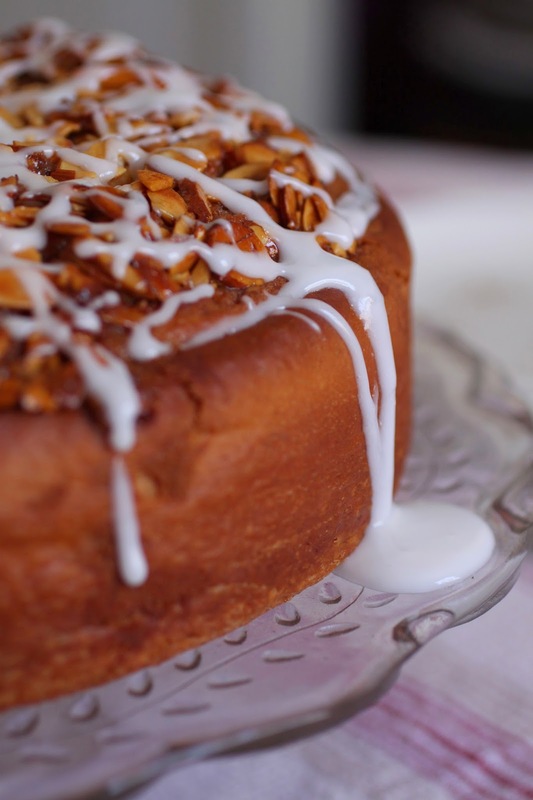 while the cake rises, make the almond topping recipe. just before baking, spread the topping evenly over the cake almost to the edges. preheat the oven to 350 and bake until a pick inserted comes out clean and the internal temperature in the center is 195 degrees F.
allow the cake to cool on a rack for 10-20 minutes. place a plate over the cake, invert it, remove the paper and cover the bottom of the cake with another plate and invert it again. 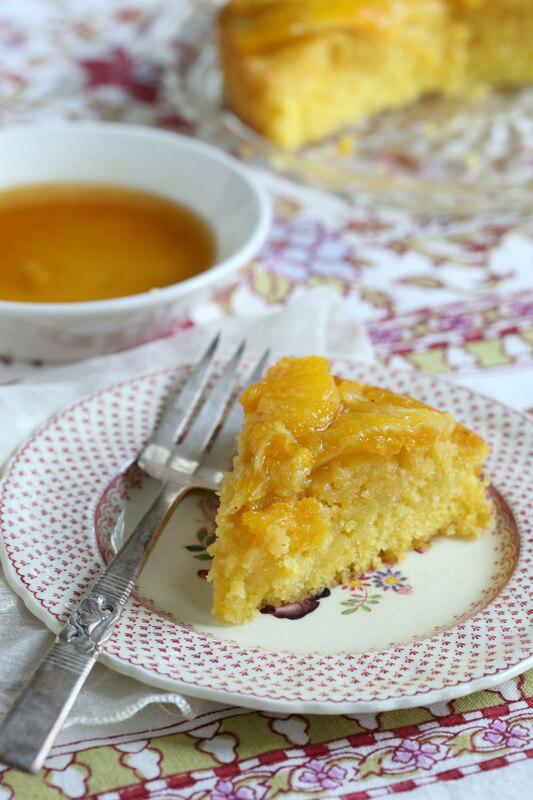 drizzle a little white glaze over the cake if desired (1 cup powdered sugar mixed with a tablespoon or two of milk to form a glaze with the consistency of honey). in a small mixing bowl, cream the butter with the brown sugar, salt and cinnamon until fluffy. add the egg and mix well. 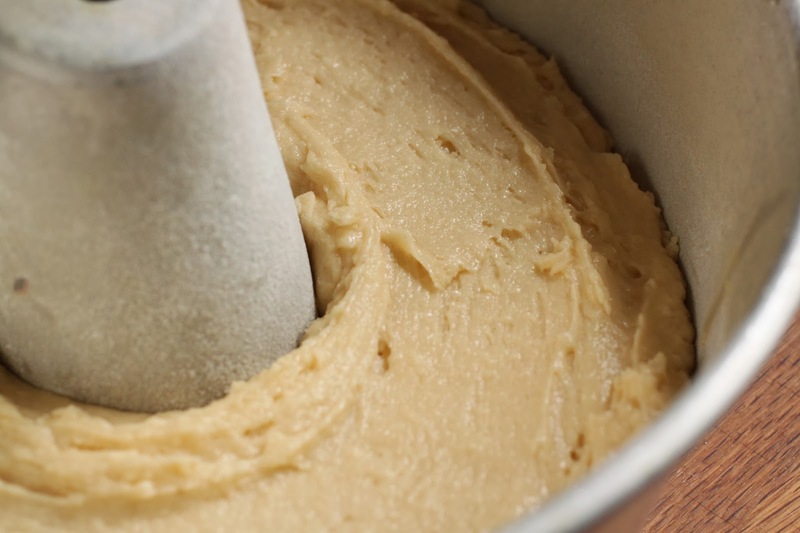 sift the flour over the mixture and combine to form a smooth, spreadable batter. keep at room temperature until needed. place the butter, brown sugar, honey and half and half into a saute pan. heat over low heat until the butter melts. turn the heat up to medium and bring to a gentle boil. 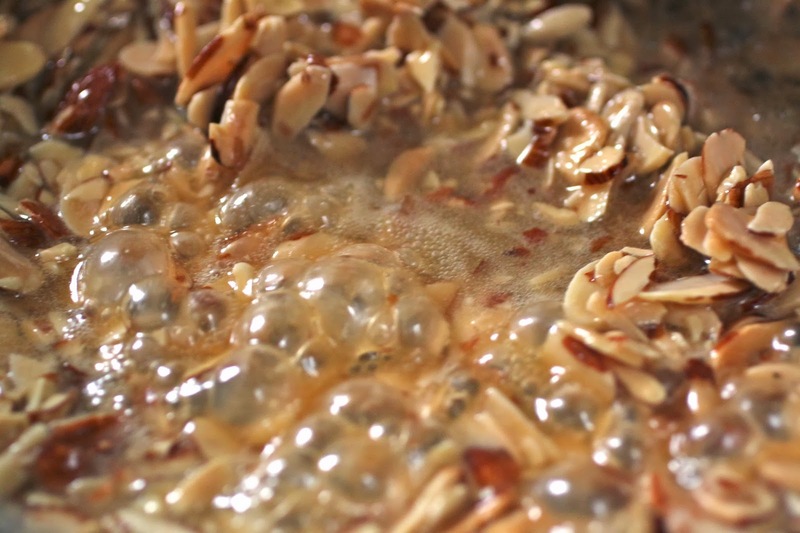 allow the mixture to boil for about 2 minutes, stir in the almonds and remove from the heat. spread the topping over the cake so that it covers the top but leave a half inch border around the edge to prevent it from running down the sides of the cake and causes sticking. what kind of holiday season would it be without gingerbread? this year, I decided to go simple with them, they are fluted rounds with a dusting of coarse sugar. perfect for snacking or dunking and even suitable for stacking with a frosting filling. need a recipe? 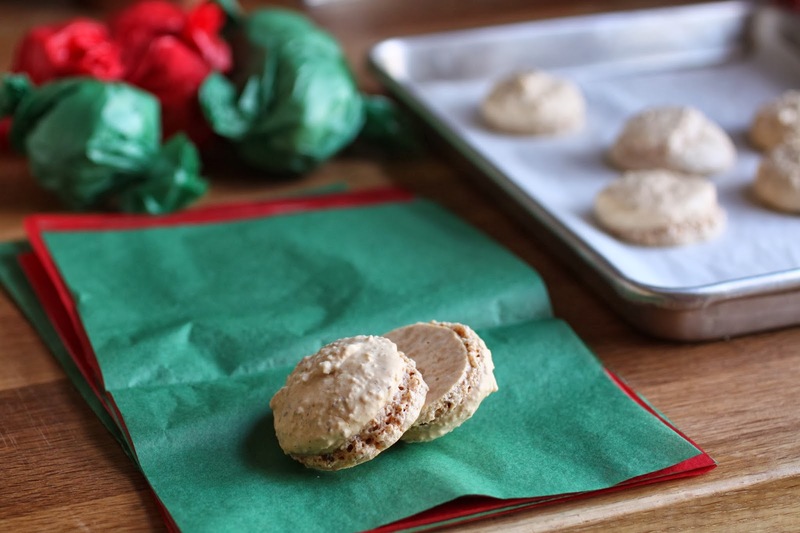 try this one from rose levy beranbaum’s book, rose’s christmas cookies. on a recent trip to atlanta, my daughter and i made a stop at one of our favorite places, white windmill bakery. they have so many cookies to choose from but these almond cookies caught my eye. when i returned home, i began a search for the recipe and after several tries, i came up with these. 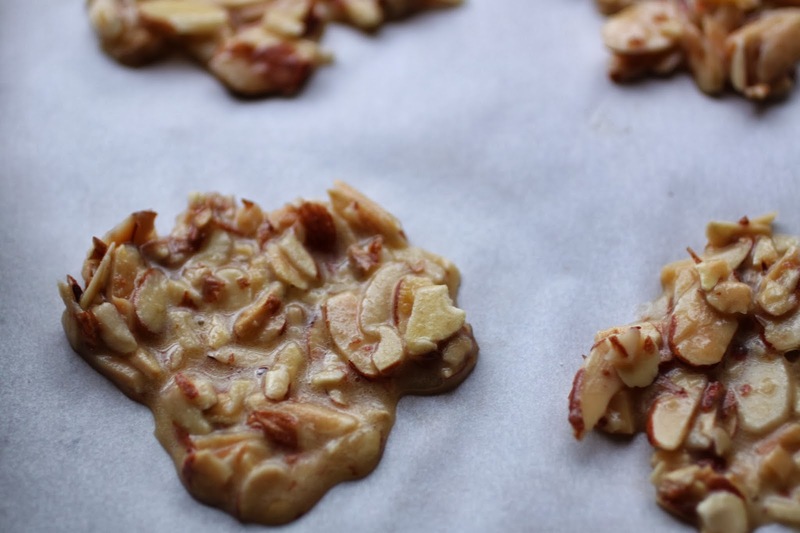 they do not look like much but if you love almonds, these things are addictive. 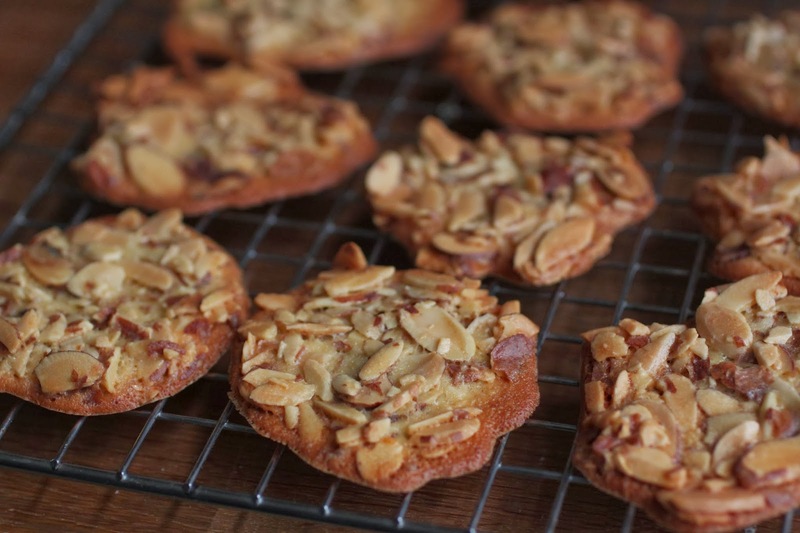 crispy and full of almonds, they are light and easy to make. i must have made at least 3 batches. for the gluten free cookie lover, they are easy to make with rice flour and every bit as tasty! try this recipe, it is the one i started with but i did add a little butter and increased the almonds. since it is a work in progress, i am not posting the recipe at this time. growing up in an area where italian foods are common, finding amaretti is easy. 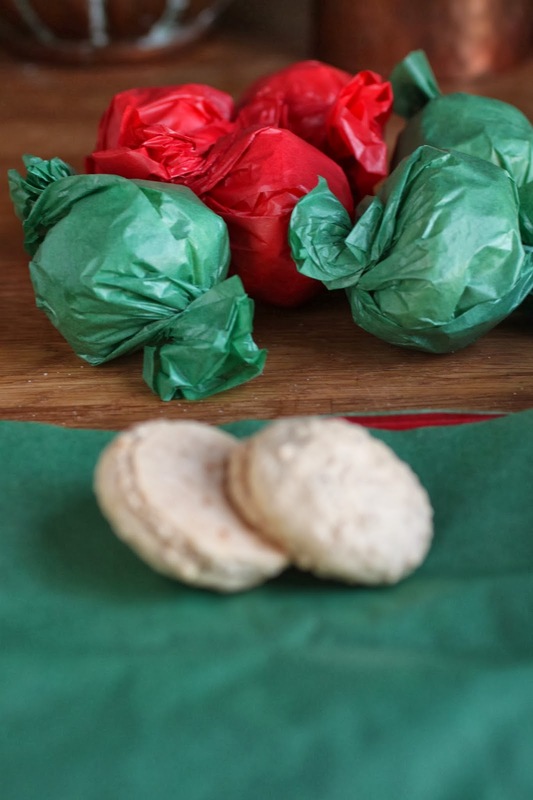 i can hardly remember a holiday season when i didn’t see the red tins stuffed full of these paper wrapped almond cookies. these memories served as my inspiration when i chose the recipe from carol field’s book, the italian baker. they mix up quickly and honestly, you will wait longer for them to bake. they bake at a low temp, 300, then sit in the oven with the heat off to finish drying out. they are meant to be crunchy but will melt in your mouth. red and green paper make them so festive, perfect for giving as gifts. the secret to the batter, getting the egg whites whipped to the proper consistency. 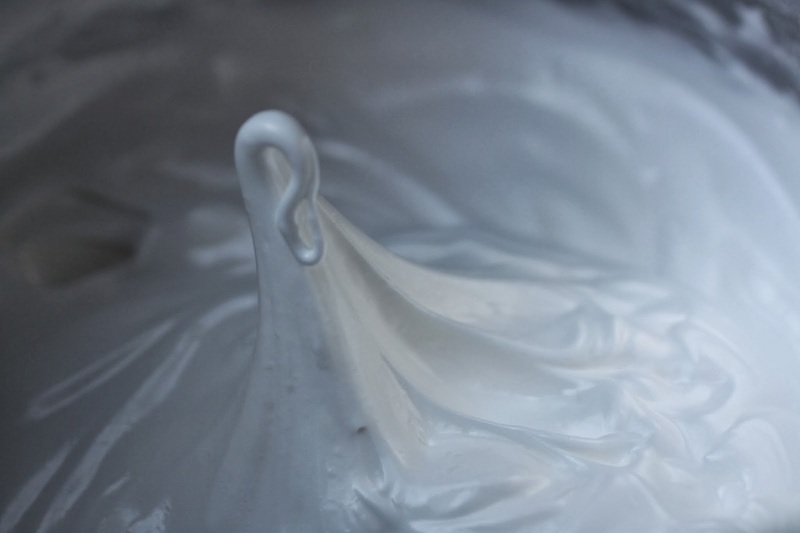 it should be a little droopy and shiny, more whipped than marshmallow cream but not as stiff as a meringue topping. to portion the cookies out, i used a small scoop. i wasn’t looking for perfect mounds and did not mind the uneven shape. 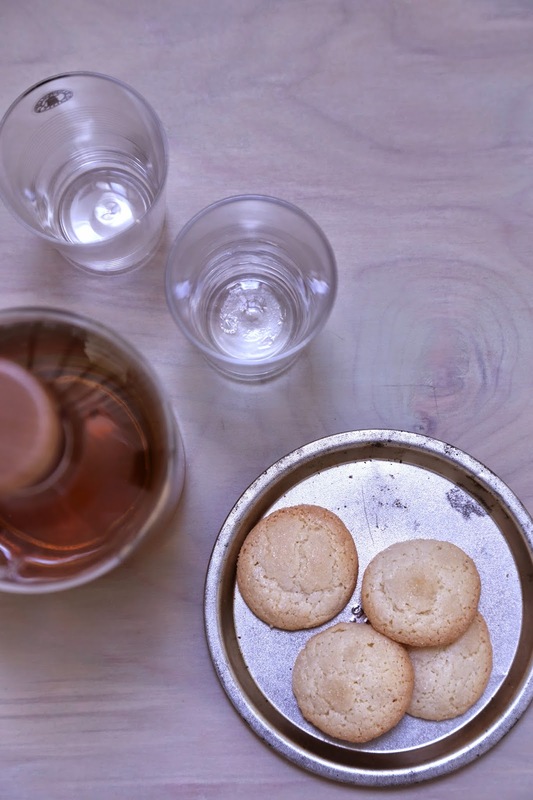 somehow, these little cookies may have taught me a thing or two about making macarons. just look at the feet on these things! these were a favorite among all who received them and i will be making them again next year. the recipe is posted online at cookinglight.com and can be found with this link . both versions of amaretti cookies found in carol fields book, the italian baker are posted. to make these cookies, i used the first recipe. 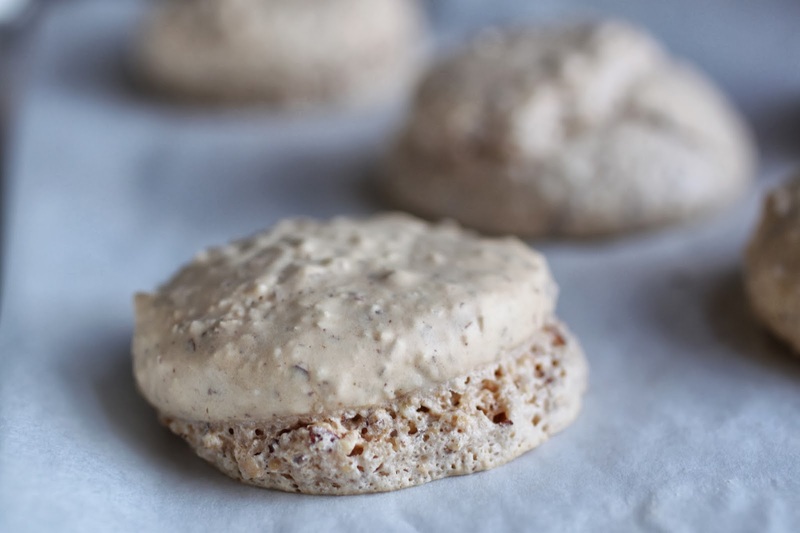 poppy seeds are often overlooked when it comes to sweets. they add a mild, nutty flavor and a wonderful crunch to cakes and scones. and of course, a little chuckle when you realize that you have just spent the last 15 minutes talking to people with the tiny little black seeds wedged between your teeth. 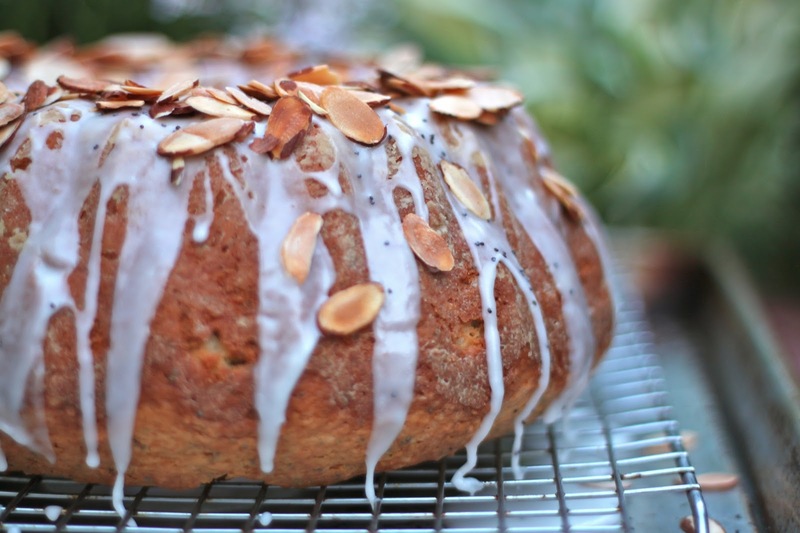 honestly, i love to add poppy seeds to a cake flavored with almond paste and lemon zest. 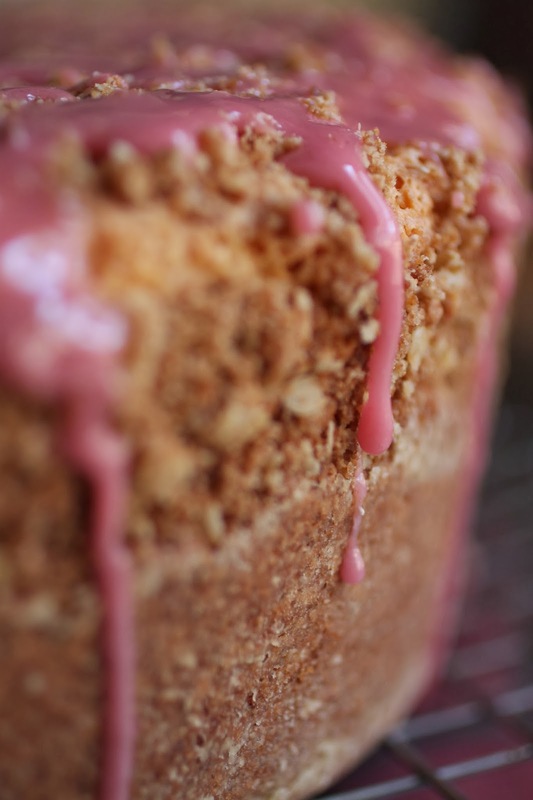 it adds a nice crunchy surprise to the texture of the cake. lemon zest also serves to brighten the flavor a bit too. this is the perfect solution to the “what can i make” dilemma when fresh fruit is still out of season or you just want to try something different. 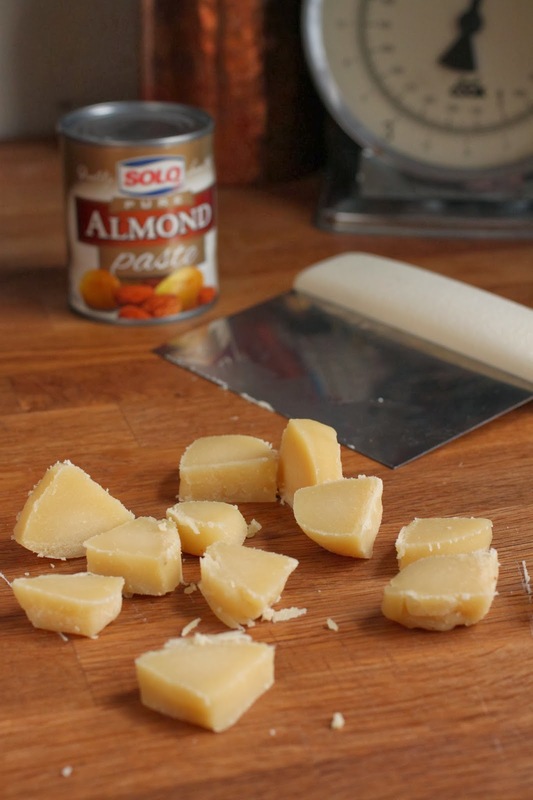 almond paste is another great staple to stock in the “larder”. it adds nice flavor, a little richness and moisture. to purchase some, look for the little cans in the baking aisle of the supermarket. they will be mixed in with the cans of pie fillings. open the can at both ends and push the cylinder of paste out. cut it in half and then cut each half into 4 equal pieces and wrap each one separately. store the pieces in the freezer and anytime you need some, you will have pre-measured 1 ounce pieces that will thaw quickly. 2 teaspoons freshly grated lemon zest. preheat the oven to 350. grease and flour a bundt pan and set it aside. place the butter into the bowl of a food processor. crumble the almond paste up and add the pieces to the food processor with sugar, lemon zest and salt. pulse to combine the mixture. process until smooth and then add the eggs, one at a time scraping the bowl as you go. dump this mixture into a large bowl. sift the flour and baking powder over the top of the batter. sprinkle the poppy seeds over the flour mixture. fold it in a few times. add the sour cream and fold until no streaks remain. scrape the batter into the prepared pan and bake until a cake tester comes out clean, about an hour. cool the cake in the pan for at least 15-20 minutes. invert the cake onto a rack and allow it to cool completely before decorating. glaze and serve! 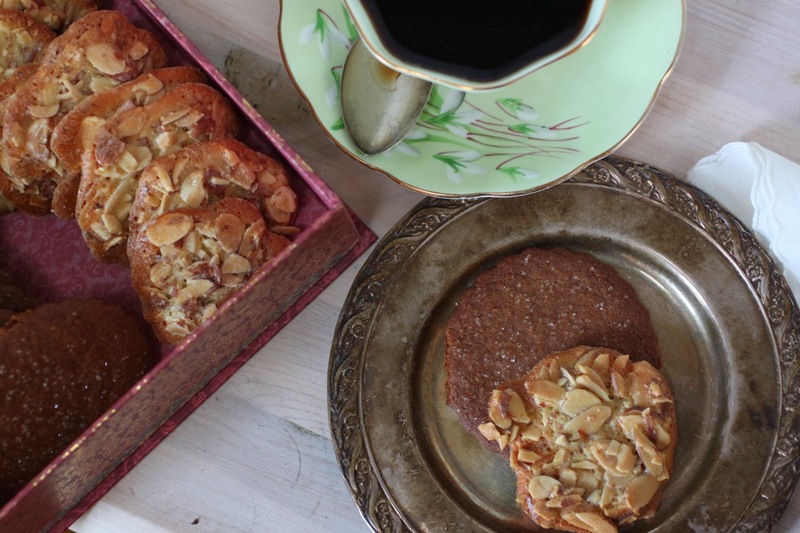 while the cake is baking, place the almonds in a bake proof dish and toast them in the oven. such a small amount will toast quickly so keep an eye on them-takes 5 minutes or less. place the sugar in a sifter or a mesh strainer and sift to remove the lumps. add the lemon juice and whisk until smooth. 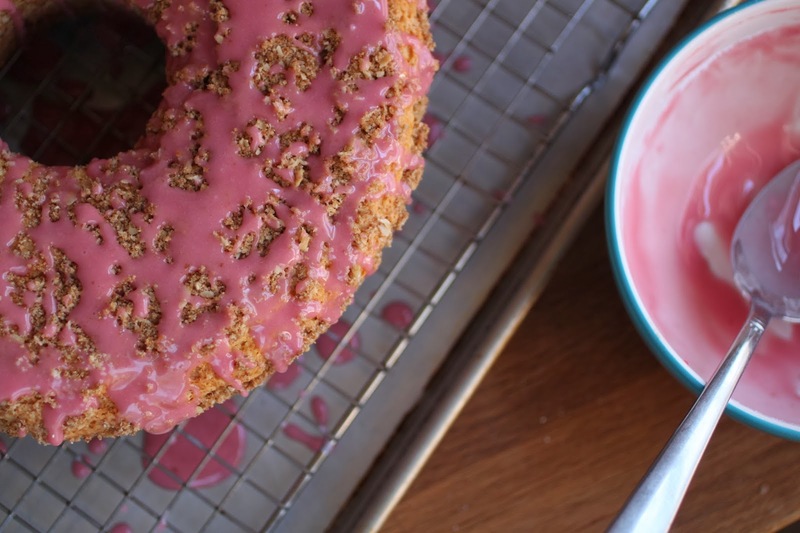 place the cake on a serving plate and drizzle the glaze over the cake. 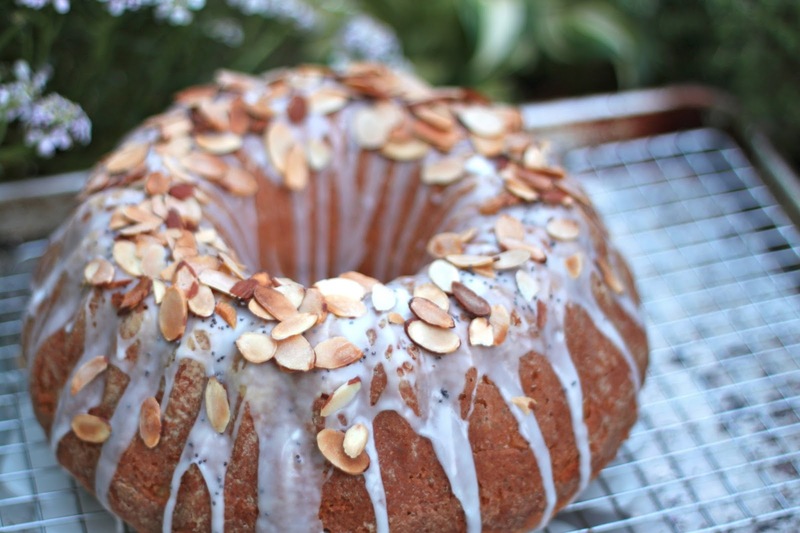 sprinkle the almonds and poppy seeds over the top of the cake. allow the glaze to set before serving, at least 30 minutes. when it comes to bundt cakes, the ones with a pound cake texture are always the easiest to unmold and slice. if they are scented with lemon and herbs, as this one is, they also seem to be favorites among my fellow garden volunteers. right now, the herb garden is bursting with thyme in bloom which made adding a few sprigs to this cake the obvious choice. since i bring a cake whenever i go to the garden, i have to keep it interesting. that stands to reason for the people eating it as much as it does for me, the person baking it. while looking through the larder in search of inspiration, i came across my container of semolina flour. then i stumbled upon the bag of almond flour in the freezer. semolina flour and almond flour both add to the texture without changing it visibly. 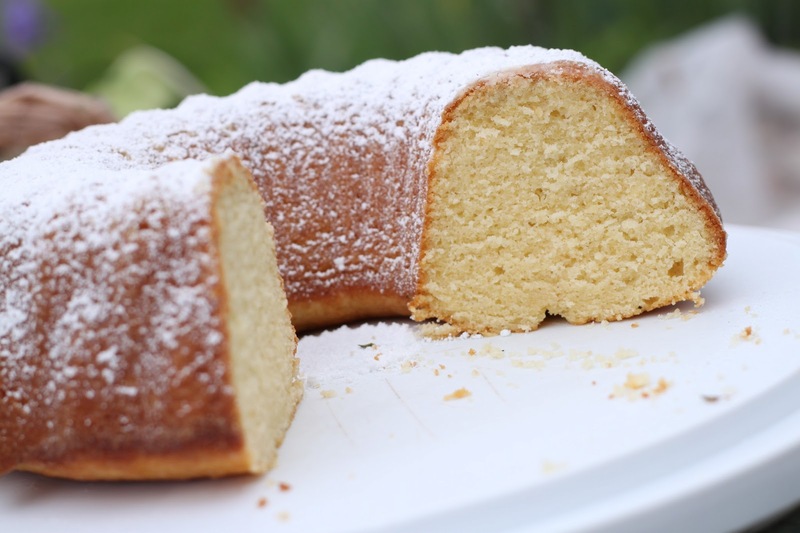 the color of the semolina and the almond flour after it is toasted accentuate the golden hue of the cake. 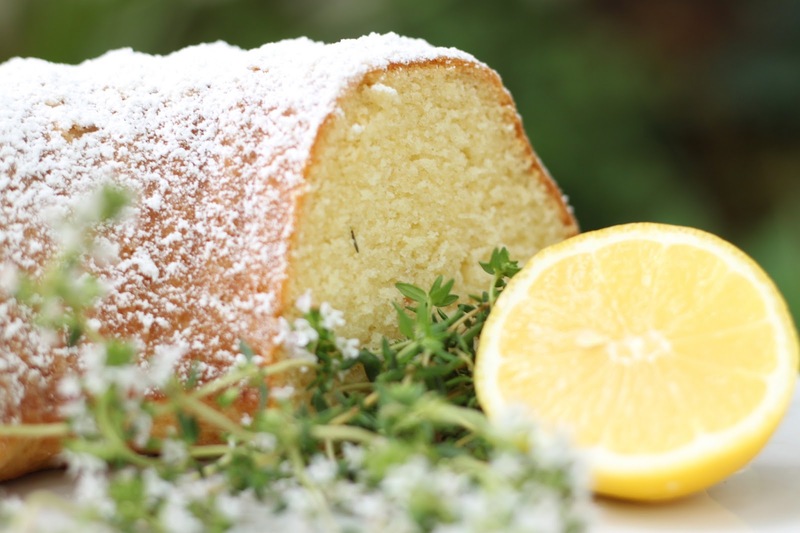 freshly grated lemon zest and thyme leaves give it a wonderful aroma as well as flavor and make this a great cake for a picnic. if you want to go a little crazy, try using slabs of this cake in place of a biscuit or angelfood cake cups for a wonderful shortcake dessert; the cake flavor would blend beautifully with fresh berries. preheat the oven to 350. grease and flour the bundt pan and set it aside. in a small ovenproof dish or pan, spread the almond flour out and bake it until golden, about 5 minutes. set aside to cool. 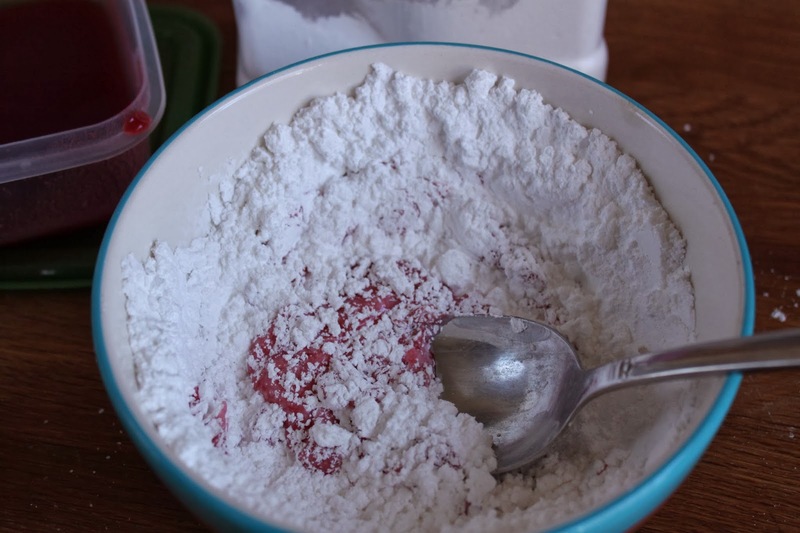 place all of the dry ingredients into a bowl and whisk it together to remove any lumps in the flour. add the cooled almond flour and stir it in. in a large mixing bowl, cream the butter with the sugar, lemon zest and thyme leaves until fluffy, about 3-4 minutes. add the eggs, one at a time and scrape the bowl as you go. add the dry ingredients to the bowl and by hand using a spatula or spoon, fold them in a few times. sprinkle the buttermilk over the mixture and continue folding the batter together by hand until no streaks remain. scape the batter into the prepared pan and bake until a cake tester comes out clean when inserted, about 45-50 minutes. allow the cake to cool in the pan for 15-20 minutes and then invert it onto a rack to finish cooling. to serve the cake, give it a light dusting of powdered sugar. 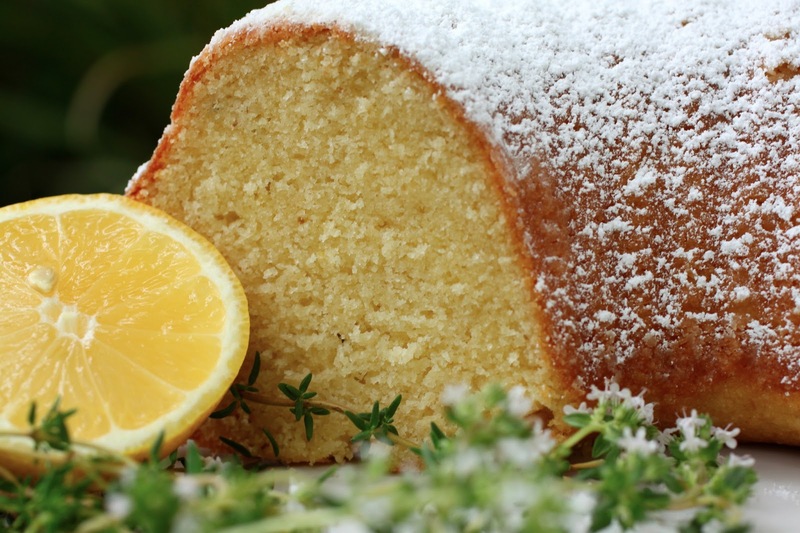 this cake recipe is very versatile; try substituting different citrus fruits or herbs as well as nut flours. orange, rosemary, lime, thyme, lavender, basil, pecan meal-you get the idea! the list goes on and on…and one more thing, have i mentioned how much i love the herb garden? best kitchen “tool” ever! while i am sad to see summer come to a close, i am looking forward to the arrival of fall produce. as much as i love visiting the farmers market in summer, i find the trips downtown in the fall almost magical. the sight of so many apples and hard squashes…the thoughts of applesauce and butters and pies…mmmmmm, that’s all i can say about it. while it is still very warm, with many days still 80+, it is no longer too hot to make baking impossible. 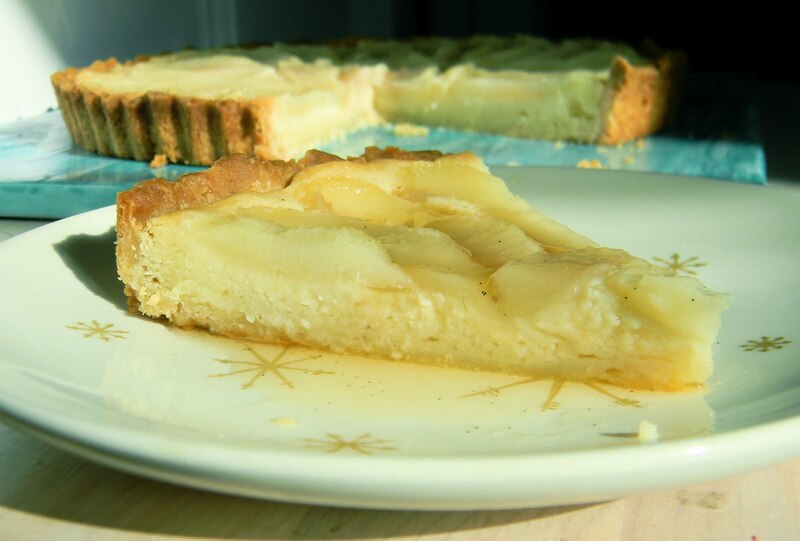 the arrival of pears from colder climates made a pear tart irresistible. not all pears make nice tarts. the best ones are those with a slightly soft texture that hold their shape when baked. for this reason, i generally use d’anjou pears that are a tad under ripe. for this tart, i had to choose between bartlett and bosc-neither being a favorite of mine. i went with firm, under ripe bartletts so that they would not turn to mush when i poached them. 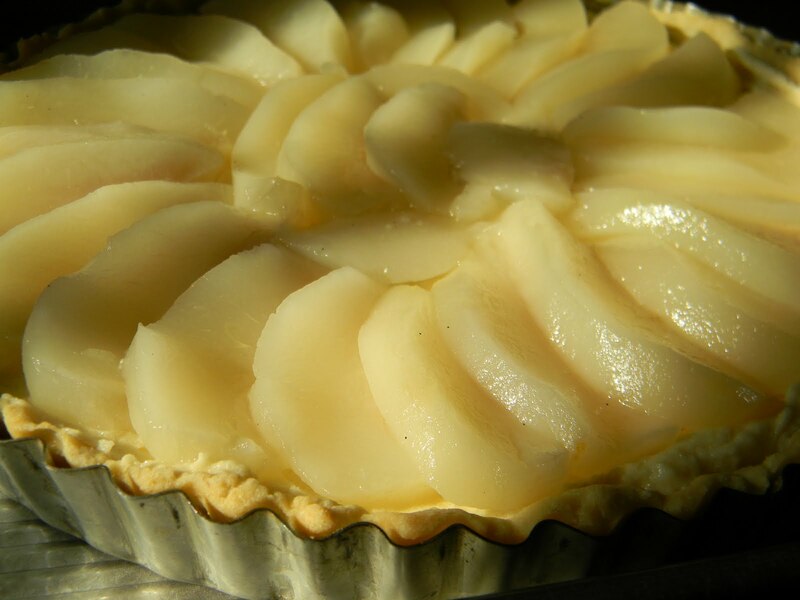 poaching is important for this type of tart-it prevents discoloration and ensures that the pears are soft when the tart filling is completely baked. it also prevents the pears from releasing excessive amounts of juices onto the top of the filling and that enables the filling to bake properly. the poaching liquid includes wine and the beauty of this tart is that you could use any type of wine and alter the taste of the pears to your liking. i used marsala because that is what was convenient but you could easily use chardonnay, sauternes, port, champagne or any other white wine. however, there is no reason that you couldn’t use a mild, fruity red and give the pears a pink tint. freshly poached and ready to be sliced. 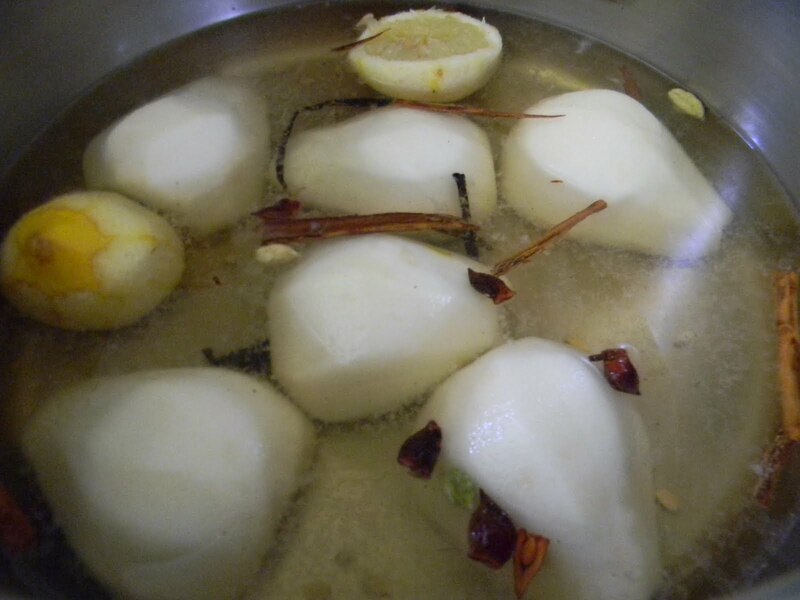 after removing the pears, place the pot of liquid back on the stove over low heat. the poaching liquid is reduced down to 1 cup and used as a syrup to drizzle over the slices as you serve them. the tart shell must be prebaked first. 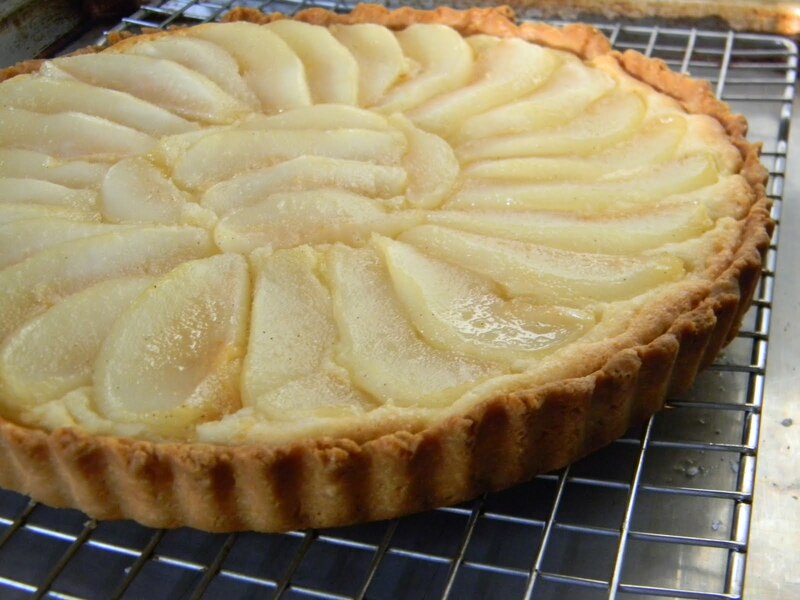 then, mix up the frangipane filling, spread it into the tart shell and layer the sliced pears around the top in a spiral. once the tart has been baked and allowed to cool completely, remove it from the pan and cut it into wedges. drizzle it with the syrup and you have an elegant fall dessert. half batch of tart dough from pie #39, second piece can be frozen for future use. place the dough into a greased tart pan with a removable bottom. with your fingers, carefully distribute the dough around the bottom and sides by pressing it and pushing it into place so that it is an even thickness throughout (no rolling pin required!!!). place the shell on a sturdy baking pan. line the shell with a coffee filter or parchment paper, fill with weights and prebake it at 325 degrees until the dough no longer looks shiny and appears opaque when you lift up the paper/weights, about 25-30 minutes. in a mixing bowl, cream the butter, almond paste and the sugar until light and fluffy. add the egg and mix to incorporate. sift the flour into the batter and mix just to incorporate. remove the weights from the tart shell and spread the frangipane filling evenly in the shell. 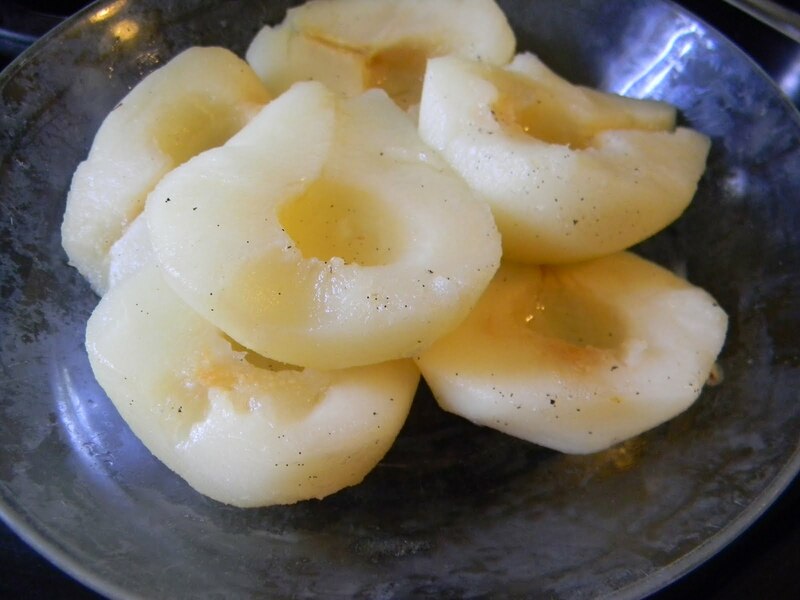 cut the pears into 1/4″ thick slices and using the photo above for reference, carefully arrange them in a spiral around the top of the filling. bake in an oven preheated to 350 until the filling sets, approximately 50-55 minutes. brush a small amount of the syrup over the tart while it is still hot to give it a shine and allow it to cool completely before removing it from the pan. cut into wedges and serve it with a drizzle of the syrup. if you would like to really indulge yourself and those you are serving this too, serve it with some vanilla or buttermilk ice cream.